King County seeks $392M for kids; critics ask, exactly for what? King County is asking voters for $392 million to turn brain-development “science into action” and support kids, families and communities. Critics want details. As King County Executive Dow Constantine tells it, his aha moment, the one that led a year later to asking voters for a new levy that would collect $392?million over six years, came when he was confronted by science. Specifically, he was at the University of Washington’s Institute for Learning & Brain Sciences for a presentation on how children’s brains develop in the early years. The institute has the first machine in the world that allows researchers to take images of brain activity in infants. “I stood up out of my chair and said something like: ‘This is it! This is what we need to be doing,’?” Constantine recalled. “He was very excitable,” Kuhl said, noting that the executive is a new father. But what exactly is the “it” we should be doing? A look at the county materials for the Best Starts for Kids levy proposal — including a video that promises to “turn science into action”— could leave voters scratching their heads. 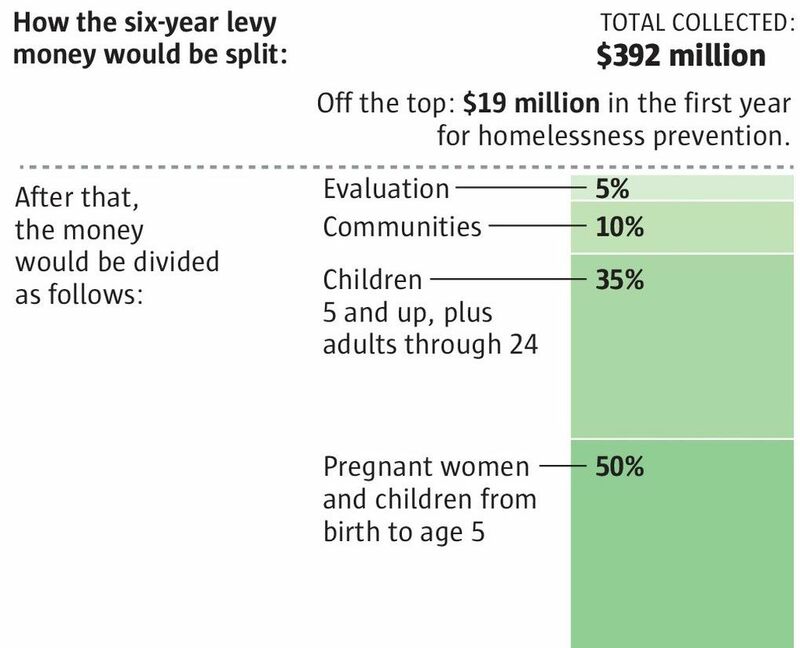 A county fact sheet says the defining purpose of the countywide levy, on the ballot as Proposition 1, is to invest in “prevention and early intervention for children, youth, families and communities.” The county further names a wide range of aims to be addressed, from improving the health of newborns to identifying depression in adolescents to helping stave off homelessness. The investments, though, are spelled out only in the broadest of strokes, mainly in terms of the ages that are to be targeted. Proposed by King County Executive Dow Constantine, with County Council approval. Length of levy: six years Annual property-tax bill: 14 cents per $1,000 of assessed value, or $63 for a $450,000 house. Roughly half the money would go to prenatal care and children under 5. Thirty-five percent would aid older kids and even young adults up to age 24 — in recognition, according to the county, that early gains need to be sustained throughout the period that young people’s brains are still developing. The remainder would help create “safe and healthy communities” as well as a multimillion-dollar evaluation system. As for what programs, exactly, would be funded, that is yet to be decided. It’s an open-ended approach that the executive maintains ensures both flexibility and accountability. “Those things that are not working as well can be abandoned,” he said. That doesn’t satisfy George Scott, a former Republican state legislator and one of the few outspoken critics of the levy. “They don’t tell you before the fact what you’re buying,” he said. Constantine argues the county has good reason for wanting in. He oversees a sprawling criminal-justice system that now takes up 75?percent of the county’s budget, constraining funding for everything else. “It’s tremendously frustrating,” he said. The county also runs the local public-health system. “We see the kids who are washed out, kicked out, who end up getting into trouble, “ Constantine said. Instead of spending all the county’s money and energy reacting to crises, he said, he wants to see the county work on prevention. She said both the city of Seattle, which is implementing a universal preschool plan passed last year by voters, and the state, which runs an increasingly high-profile Department of Early Learning, focus on academic success. That’s true, but some existing programs also address health and “whole child” issues. The city, for example, funds a highly regarded nurse home-visits program for pregnant women and new moms — but only within city limits. Best Starts would expand such visits throughout the county and also try out some different types of programs within the city so the county could “compare and contrast” their effectiveness, according to Quinn. If there is some mission overlap, Best Starts is nevertheless likely to fund some things that aren’t getting money, or much money, elsewhere. That’s because the county is considering so many ideas. Sheila Capestany, who would lead implementation of the levy if it passes, came to an interview with a thick binder stuffed full of program descriptions. Some of the programs are already operating locally and could be expanded; others have made a name for themselves in other parts of the country. One program offers courses for struggling parents. Another holds group sessions for third- through eighth-graders who exhibit PTSD, depression and behavioral problems. Yet another teaches people who work with adolescents and young adults to recognize the signs of psychosis. But the nonprofits that run these programs and others would still have to compete for funding if the levy passes. (Ballots in the all-mail election must be postmarked by Nov. 3.) An advisory board would then make recommendations. The county has made only a few choices already. They include the nurse home-visiting program and a new, $19?million homelessness-prevention program. Although county materials don’t spell this out, the money for the homeless program would “come off the top” of the revenue collected in the first year, according to Quinn, leaving the remainder to be divvied up by age and so on. “We wanted a proven program that we could launch right away,” Quinn explained. She said it is modeled after a successful pilot program conducted by the Bill & Melinda Gates Foundation that asked participants one key question: What do you need to be stably housed? Striving to help people before they’re forced onto the streets — not after, like most homelessness programs — it would then attempt to provide whatever was needed: say, money to clear up a debt that’s showing up on a credit report or car insurance that makes a job, and therefore a home, possible. Is this amount of specificity enough for voters? If the county’s Proposition 1 is approved, homeowners would pay an annual 14 cents per $1,000 of assessed value, or $63 for a $450,000 house. Capestany points to Seattle’s $235 million Families & Education Levy, renewed by voters time and again for the last 25 years, as a similar model. That levy also provides for a competitive process for would-be program operators that only happens after the vote. Yet, while it may have been vague when it began in 1990, in recent years Seattle’s levy has gotten “very detailed,” according to Holly Miller, who has headed the city’s education work for the past 11 years. She said that before the last proposal went to voters in 2011, a committee spent nine months drawing up a 62-page document of recommendations. Miller said she guesses the county will “have a lot more back-end work” to do if Best Starts is passed. Quinn offered another comparison: the Seattle Housing Levy. “It didn’t say we will create X number of units,” she said. But it did have an easily understandable concept of creating affordable housing. The success of Best Starts may ultimately rest not so much on generosity but comprehension. Will voters get what it’s all about?